Scooperman Dog Poop Scoopers for all your dog waste removal needs. For an immediate response call or text 416-551-POOP (416-551-7667). 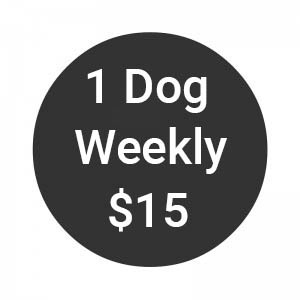 For the last 15 years SCOOPERMAN dog poop scoopers have been scooping dog poop in and around the Toronto area. We scoop dog poop for one reason – we love dogs. We excel at being very thorough while scooping poop and making absolutely sure that your yard is completely secure before we leave. We scoop poop everyday anywhere West of the DVP, East of Hamilton, North of Lake Ontario and South of Brampton. 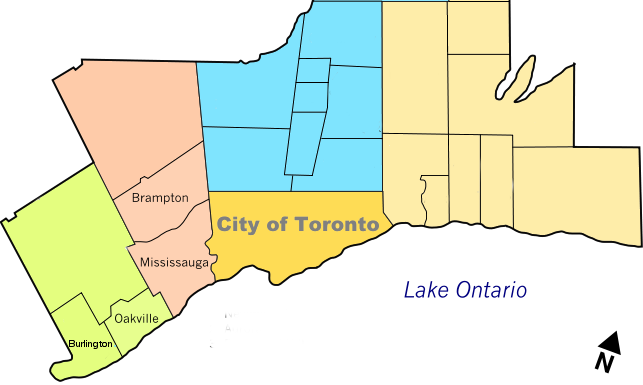 Proudly serving all of Toronto, Etobicoke, Brampton, Mississauga, Oakville and Burlington. We will also try to accommodate you if your house is just outside these areas. ONE-TIME SPRING CLEAN-UPS START AT $50. Scooping poop is a messy business and SCOOPERMAN poop scoopers do it better, faster and cheaper than anybody else in Toronto. 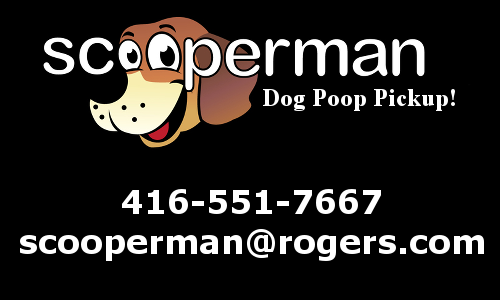 SCOOPERMAN dog poop scoopers can be contacted by phone or text at: 416-551-POOP (416-551-7667). For a fast, free quote fill out the form below and SCOOPERMAN will get back to you within an hour. We can usually be at your house within 24 hours depending on where you live in the Toronto area. Please also feel free to fill out the form above and hit “SUBMIT”. You will receive a reply within an hour. We’ve been using Russ for well over five years now – probably closer to 10. He is amazing – professional, reliable, friendly, great at his job. Loves dogs too. Always communicates well to show he is on top of record-keeping, weather conditions, etc. A really nice guy who treats his clients and their dogs very well. A LOAD Off Your Mind! I’ve been using Scooperman for about 5 years now, and it’s so great to know that my yard is cleaned once a week if I can’t get to it. The price is reasonable, and Russ is always super-friendly and reliable. We have been using Russ for several year now and he is great. Our dog loves him and often plays with him while he works and he is always professional and punctual. Scooperman is SUCH a great service! We adopted a rescue puppy and loved having her, EXCEPT for the backyard cleanup each time our kids wanted to play! Luckily we found Russ of Scooperman! Russ pops in weekly and does a great job of cleaning up our yard. He has made all the difference in our enjoyment of our dog! He is also a really super guy. Our dog loves him and I enjoy saying hi and catching up with him. We have used Russ at Scooperman for the last three years and he’s terrific; he takes care of our yard flawlessly. That’s not always easy because our dogs get so excited when they see him arrive and have to go out and play with him when he’s doing his job. This has turned out to be an invaluable service for us; he turns up every week without question, we electronically send him the fee and we never have to worry about cleaning up after our dogs. Not only WOULD we recommend Russ’s services to others but we do all the time. SCOOPERMAN dog poop scoopers will quickly, thoroughly remove all dog waste from your yard and ensure that it is secure before we leave, EVERY TIME. Dog poop scooping is a messy business. Leave it to SCOOPERMAN dog poop scoopers. We look forward to meeting you and your dogs. Look for our SCOOPERMAN BLOG and get ready to follow us on Facebook!